The 25th Sacred Music Colloquium will be held from June 29th through July 4, 2015 at Duquesne University in Pittsburgh, PA. Every Colloquium is a joyful, spiritual, musical, social, and liturgical celebration of our Holy Faith and the Sacred Music that has first place in that faith - Gregorian Chant. New friendships are created, old friendships are rekindled, and professional relationships are renewed, all for the greater glory of God. It has become a life changing experience for many. My good friends, if you have been undecided about attending, stop hesitating and decide to attend now. You will not regret it. As a matter of fact you will thank the Lord for the wonderful experience. 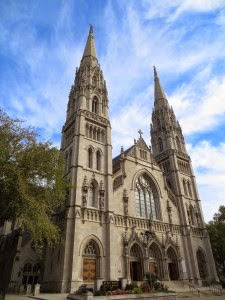 The battle, and it is a battle, to reclaim "the sacred" in the Liturgy is intimately connected with Gregorian Chant, and the singing of the Propers at Mass. We are supposed to sing the Mass, not sing at Mass. Come and learn and come and do that which the Church wants.